Padding in areas that receive the most pressure. Maximizes your Bicep and Triceps workouts by Allowing maximum Stability and isolation. UNIQUELY CONTOURED RIGID METAL DESIGN allows you to isolate your arms and shoulders while keeping your back and elbows locked in the perfect curling position. 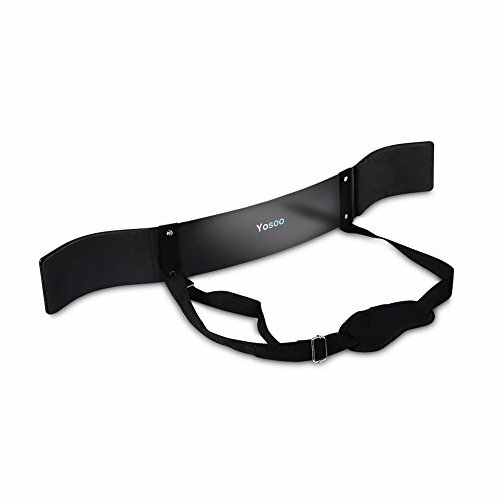 PRODUCT FEATURES: It features a quick and easy adjustable strap with extra added Neoprene Neck Pad to help increase comfort whilst lifting and enables to achieve perfect ergonomically correct biceps workout. THE MAIN FEATURE OF THE BICEPS is that it provides an assistance to perfect form therefore allowing you to maintain perfect form through every curl of a dumbbell or barbell. THE ARM BLASTER ENSURES arms are not moved at shoulder joints and arms are held at correct position. This enables fuller pump, total muscle fatigue and stimulating maximum muscle growth.